According to a report undertaken by the International Livestock Research Institute report on ‘commercializing the smallholder goat sector in India’, there is huge potential to enhance the livelihoods of and business opportunities for poor farmers in the rural areas of the states of Bihar, Odisha and Uttar Pradesh. Key recommendations in the report include the establishment of vibrant farmer organizations to support production, processing and marketing; the privatization of fodder production; the establishment of private animal health care service providers; the promotion of commercial goat farms; and support for the existing sanitary and hygienic meat production infrastructure. The report is part of a scoping project for public private producer partnerships in small ruminant value chain development in India launched by the Bill & Melinda Gates Foundation and the International Fund for Agricultural Development last year. The objective of the project is to build solid understanding among goat industry stakeholders (public and private) on the profitability, competitiveness, and importance of investing in the goat sector as a mean to enhance the livelihoods of and business opportunities for poor farmers in the rural areas of Bihar, Odisha and Uttar Pradesh. Contributing to this scoping project, ILRI established a participatory process of constructive engagement of all relevant stakeholders in the sector through the innovation platform (IP) approach. ILRI organized and facilitated two rounds of IP meetings in the three states. In these meetings more than 250 participants with different backgrounds and interests (farmers, producer organizations, development organizations, finance institutions, research institutes and policymakers etc.) came together to jointly diagnose problems, identify opportunities and find ways to achieve their goals. Based on the IP interactions and on related ILRI studies and project experiences, this report highlights the policy and technical challenges and provides practical recommendations for BMGF, IFAD and other people keen to invest in small ruminant development to transform the sub sector in India. Padmakumar, V., Baltenweck, I. and Weber, C. 2016. 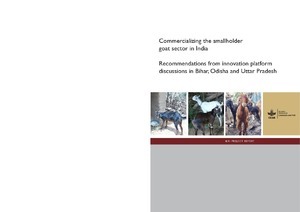 Commercializing the smallholder goat sector in India: Recommendations from innovation platform discussions in Bihar, Odisha and Uttar Pradesh. ILRI Project Report. Nairobi, Kenya: ILRI. Tags: BMGF, IFAD, innovation platforms. Bookmark the permalink.